What a wonderful week in Santa Fe. The climate is delightful compared to southwest Texas in August and the company of my three brothers and their spouses for our yearly visit proved wonderful. As always we stayed at the same hotel along with several other couples, Texas friends, and wined and dined with enjoyment. The opera, “Golden Cockerel,” was entertaining but I must admit, agreeing with my brother David, that opera is not my favorite form of entertainment. 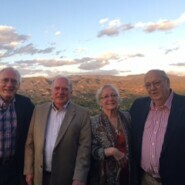 I visit Santa Fe because my brothers and friends are there, the food is excellent, the weather is cooler than summer in Texas and the scenery is a welcome change.